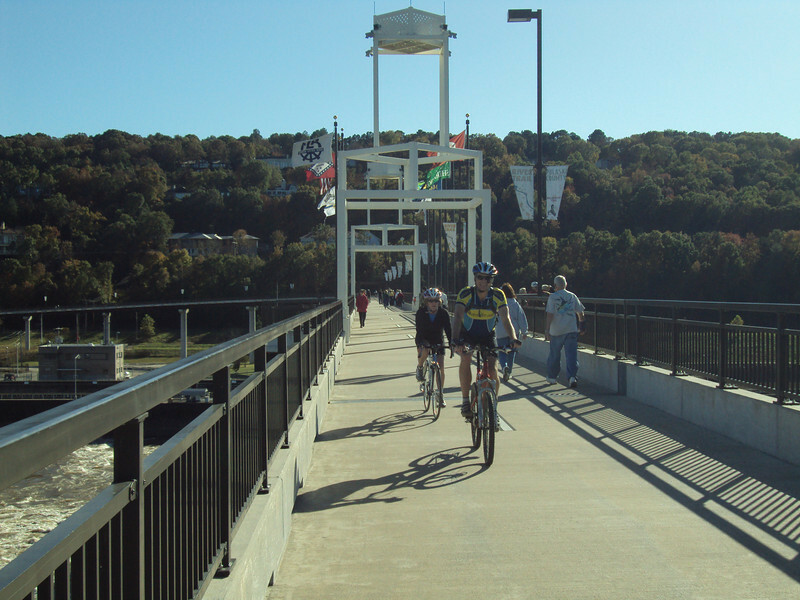 In addition to general recreation use, the Big Dam Bridge is the site of nearly a dozen walking and biking events throughout the spring and summer. The Big Dam Bridge in Pulaski County, Arkansas connects Rebsamen Park in Little Rock with Cooks Landing Park in North Little Rock. This extraordinary piece of infrastructure is nearly one mile in length and was constructed by drilling into the top of the Murray Lock and Dam on the Arkansas River. The bridge is an integral portion of the Millennium Trail, a collection of riverside trails along both sides of the Arkansas River that, when completed, will create a 15-mile multi-use bike path. The bridge's exemplary design elements, which include L.E.D. lighting and generous 14-foot right-of-way, have resulted in twelve awards from a number of professional associations and societies. The bridge opened September 30, 2006. Federal TE funding amounting to $300,000 was awarded to the project leveraging a local match of over $11 million.